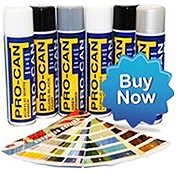 Macrofan 2k Paint ideal for use on cars, motorcycles and automotive use. Requires a 2 Pack Hardner and a 2 Pack Universal Thinner. No Lacquer is required for this product.